Didn't have any mood to prepare bento from yesterday but finally managed to make it this morning. I think I got way too tired over the weekend which made my week started so slow and uninspiring. Hope tonight I can pull myself together again and find some ideas to make bento for this week. I did a simple and quick cooking for today's bento. Inside the box : yellow bird on the top of the rice, cucumber flowers, sauteed chicken minced meat with tofu & potato, stir fry chayote, half hard boiled egg, and strawberries. Salt and pepper were put inside the small yellow food cup. 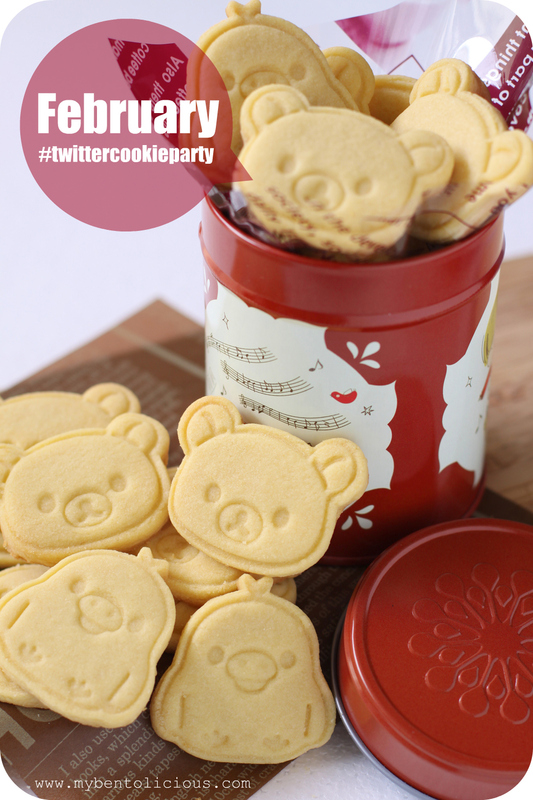 I baked some buttermilk cookies on Sunday night to join the fun with other tweeps this month for #twitterfoodparty #twittercookieparty ... You can join this event too. #twitterfoodparty is held every month (on every last Monday) with a different theme. aww.. lovely butter cookies..I am sure Kids will love these. ah, nice cookies... i was thinking to join twitterfoodparty but gave up the idea when i found not enough time to bake during weekend. Love that cheerful birdie! Hope I can feel so happy tomorrow morning too. Love those adorable cookies too! I've never been to #twitterfoodparty before...must take a look. Thanks and have a good rest. I'm feeling the same way this week, so tired that it's difficult to get my mind to work :) You pulled through with a great bento, though!! The little bird is so cute and I love the way you did it's wings. I hope that the rest of your week is better! Lia, so intricate! I can't believe you just 'put this together'. lol! I just love this one.. so happy and so spring like. @ChantaleP : Thanks a lot Chantale! Your comment always makes me smile and I'm happy to read it :) Hope you are feeling better soon! Looks like a fun bento to me! I love the birdie and cucumber flowers. I needed this to get inspired! I really hope you can have your rest and your back is not so painful by tomorrow..
And the cookies! Yum yum! so delicate presentation too, I loved them! 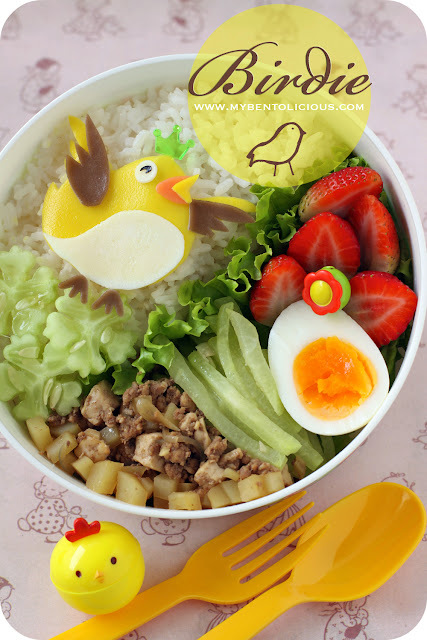 Loving the radiant golden tones of this bento and of course the sweet birdie theme! Perfect details in your beautiful style...cutest cookies, too!! Love the cookies. Were they easy to handle? Can you share the buttermilk cookies recipe? Thanks. I love your butter cookies too! @Mayu : Thanks a lot Mayu! The buttermilk cookie looks yummy delicious!. The birds & bears are so adorable! Wish i have this cute cookie cutter too. Can u please share your recipe with me too :D? My email is emilywml@yahoo.com. Thanks a lot & GBU.